When it comes to men’s wedding bands, the sky is the limit. Here at deBebians, we sell a variety of styles in a variety of metals. Scroll through the men’s wedding band section and you’ll see all the different options. Men can choose from titanium to platinum to gold to palladium. You can choose to have diamonds or no diamonds, two tone or even and handmade wedding band. I see all these different styles of bands fly out our door. There really is a wedding band out there for any man, even those who say right away that they don’t want to wear a wedding band. Believe me, if you try on different styles, you may find something that you love! Today I want to talk about men’s diamond wedding rings. Men either know if they want diamonds in their band or they know they definitely do not want diamonds in their band. Rarely do I see a man on the fence… they seem to know right away. I’ve even chatted with men before who say if their wife can have bling, well then so can they! This wedding ring is 7mm wide and features two channel set white princess cut diamonds weighing about 0.30cttw. This is a popular men’s style I believe because of the classic pipe cut design. If you are looking for more of a statement style men’s wedding ring, I believe this could be the one! 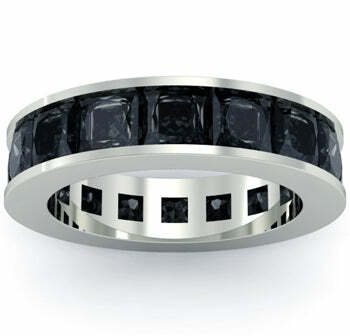 This ring is about 5mm wide and features 7.00cttw black princess cut diamonds. If you’re a man that wants diamonds but you prefer black diamonds, this is your ring. 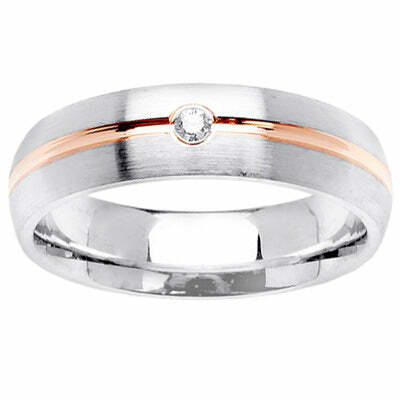 This 6mm domed diamond wedding ring also features a rose gold groove down the center of the ring. This may be a little over the top for some men, but perhaps your wife has a rose gold engagement ring and you want to match her. This could be the perfect option to tie all of your rings together. 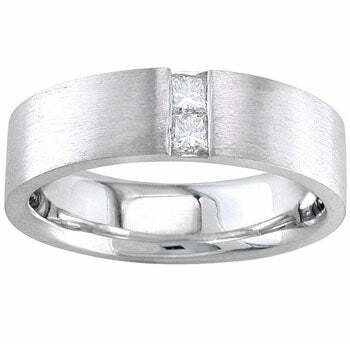 Men, remember when you are shopping for your wedding band, be sure to consider a diamond wedding ring. Your ring doesn’t have to be decked out with pave set diamonds. It can feature only a few diamonds, just something to add a little extra sparkle to your wedding band. If you need assistance, do not hesitate to call on us. Happy shopping!